I do like Great Yarmouth. More than anywhere else in East Anglia, with the possible exception of Kings Lynn, you feel that this is a place which has broken the surly bonds of proximity to London, which is, after all, fewer than 150 miles away, and instead yearns out for the sea, and Europe. Yarmouth takes its name from the mouth of the River Yare: tightly crammed onto a narrow tongue of land, surrounded on three sides by water, it retains its endearingly shabby character and a sense of its own singular history, despite the best efforts of the Luftwaffe and the Borough planners, who over the last half-century must rank as some of the most neglectful and bone-headed planners of any of England's medium-sized towns. Great Yarmouth has a seedy brashness, a jollity which overwrites the hard times it has suffered, and it has suffered indeed: the town lost a greater percentage of its houses to German bombing during the Second World War than any other town in England. The disappearance of the fishing industry led to an unemployment rate of mining town proportions, and the rugged working class character of the town, without any significant areas of middle class villas or suburban metroland, has often been a poor advocate for itself. Can there be a more hauntingly lovely town centre street in East Anglia than South Quay? On one side are the confident 19th and early 20th century buildings, the town hall, the banks, the merchants' houses, the town pubs, while on the other side is the quay of the steely, silent Yare, the great ships parked opposite the buildings. For Great Yarmouth is still a major port, and the warehouses on the Southtown side remind those who pass beneath the great red brick buildings on the far bank exactly where all this prosperity came from. And a twenty minute walk will take you across the heart of the town to Yarmouth's wide, white, sandy beaches, for today this is above all else a seaside town, of course. And while the beaches are by no means as lovely as those of Lowestoft ten miles to the south, nothing can beat Yarmouth for the sheer number of its amusement arcades, its fairgrounds, its candy floss stands and its cheap tat shops. Kiss me quick and squeeze me slow: this feels like the seaside used to, like it ought to, before we got all sophisticated about such matters. It reminds me of my childhood. In summer, all Norwich seems to come here for a cheap and cheerful day out, and you cannot get a seat on the train for love nor money. When I first knew Great Yarmouth as a child in the 1970s, the roads to the north of the town centre were lined with small hotels, and while these certainly still exist, the days when thousands of people came to Great Yarmouth for a two week holiday are now gone. The former hotels are now residential care homes, or divided up into flats and bedsits, which are still not called apartments, thank goodness. The vast coach park immediately to the north of the town centre is still discernible as the site of Yarmouth Beach station, which brought the holiday-makers here. In those days, Great Yarmouth had three railway stations, but now there is only one, with its single line playing host to an hourly shuttle into Norwich. That the demand for cheap meals and takeaway food has not diminished is testified to by the large population of Greeks, mainly from Cyprus; they started arriving here during the days of the fascist dictatorship and the war in the 1970s. The vast former Anglican parish church of St Peter, redundant in the 1980s, has been happily reborn as the Greek Orthodox church of St Spiridon. Today, especially in the area to the south of the town centre, you are as likely to hear Greek spoken on the streets as English. And what English! This must be one of the last towns in England with a strong, identifiable accent of its own - people do not have Norfolk accents here, they have Great Yarmouth accents, which stand out in the streets of sophisticated Norwich as much as voices from Birmingham or Newcastle-upon-Tyne. People who have never been here know Great Yarmouth from books, especially the opening few chapters of Charles Dickens's David Copperfield, for here it was that the Peggoty family lived in an upturned boat on the beach, and here it was that David was happy. Dickens was writing in the 1840s about a Great Yarmouth of a quarter of a century earlier, and you will find few traces of Dickens's Yarmouth today. Great Yarmouth underwent a massive building boom in the 1860s, and this and the modern era define its character above all else. But wandering around the Middlegate area you may be struck by how, among the dull and often crass buildings of the 1960s and 1970s, there is occasionally some extraordinary survival, a 16th century house wider at the top than the bottom, perhaps, or an early medieval tollhouse, or a grand 18th century frontage with a perfunctory building tacked on behind. This was the heart of the area destroyed by a succession of German bombing raids in 1941 and 1942. Because of Great Yarmouth's singular situation on a spit of land, its population lived crammed into narrow alleys called rows, many early medieval in origin, the bulk built in the 15th and 16th centuries. This unique medieval townscape of perhaps 140 rows survived up until those fateful nights. It was almost completely destroyed, with a consequent heavy loss of life. Hauntingly, several bombed buildings have been left exactly as they were after the destruction, in a railed off area behind the replacement Unitarian church. It is easy to forget quite how prosperous Great Yarmouth was during the medieval period. As Bill Wilson reminds us in the revised Pevsner, at the time of the 1334 merchant's tax register, Yarmouth raised more in the subsidy than either Norwich or Lynn, which a hundred years before had been exceptionally prosperous places. Only York, Bristol and London were richer than Yarmouth on the eve of the Black Death; the town had provided three times more sailors for the attack on Calais than London, and in 1348 there were 220 boats on the Yare river mouth. But the following year the Black Death wiped out perhaps two-thirds of the townsfolk, and it would take Yarmouth hundreds of years to recover its former prosperity. It was at this time that the town walls were completed, and it is still possible to trace the course of the walls today, especially to the south of the town. On three sides, the walls defended Yarmouth from the sea, on which it resolutely turned its back; on the river side, there was no wall. Within the walls, at its widest and most northerly point, the town had its market place, still a busy one, and further north than that, looking down the length of the market place, over the rows, the warehouse, along the river and out to the sea, they built a great church, dedicated to the patron saint of sailors, St Nicholas. A hundred miles up the east coast is the great port city of Hull, which dwarfs the town of Great Yarmouth, but with which Great Yarmouth otherwise shares very much in common. There, the great late 15th Century church of Holy Trinity is claimed as the country's biggest, which may well be true in terms of its sheer bulk. 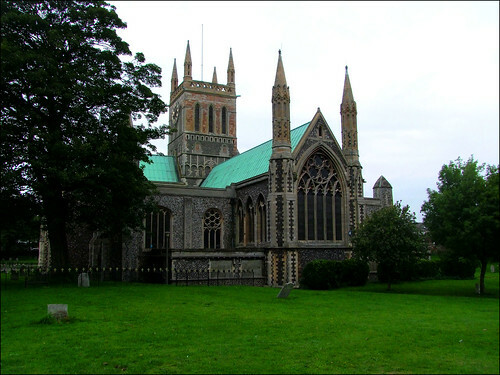 But here in Yarmouth the medieval merchant wealth had done better than that, and here it was that, in terms of floor area, the burghers of Yarmouth built the largest church in England. Whereas the Hull church towers over and dominates the medieval street plan, here in Great Yarmouth St Nicholas seems to sprawl, its width and length dwarfing the central tower. Holy Trinity is fully in proportion, a typical late medieval church writ large, but St Nicholas is not. This great building has an idiosyncrasy, and to visit it is to see a church in a new way. There are several reasons for this, not least that this building was largely complete a full 150 years before Holy Trinity. There is no clerestory, and hardly any of the language of Perpendicular which would inform and shape so many of England's great urban churches. The setting of the building below the level of the market place means that the overall impression is of the green of the vast copper roofs. 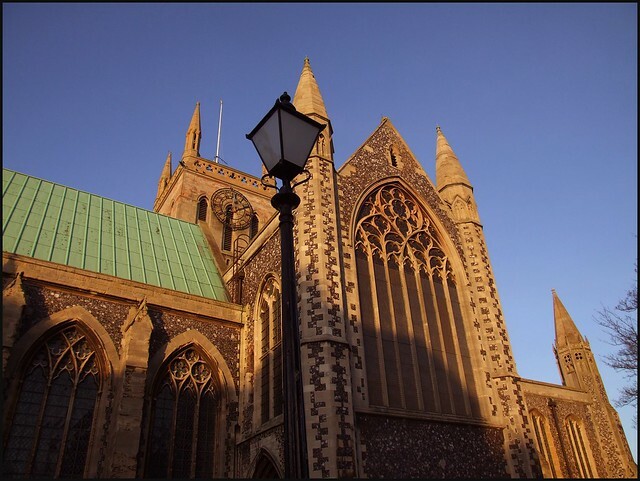 To see it in the low sun of a cold winter's afternoon, with the stone and flintwork glowing and the frost beginning to gleam on the parapets, is to see one of East Anglia's most beautiful urban sights, I think. Walking around the outside of the building is a not inconsiderable task, and you soon become acquainted with the rhythm of the flintwork, windows and stone dressing, which make it feel that it is all of a piece, which is an illusion, although there are reasons for it. The west front is vast, but hidden by trees and in any case visible only from a minor road.To the east of the chancel is a haunting 1840s gravestone which tells us that beneath this Stone rests two Babes that brought Happiness to their Parents although they are Dead. I wondered if Dickens had ever spotted it. And as you come back round to the south porch you'll find one of England's most unusual 19th century gravestones. It remembers George Beloe, a nine year old boy who was unfortunately drowned when the suspension bridge over the Bure, just outside of Yarmouth, collapsed in 1845. A large crowd had gathered on the bridge to watch a clown float down the river in a barrel pulled by geese, and the bridge collapsed when they surged from one side to the other as he went under. The full death toll was never known, because many of the victims must have been washed out to sea by the fast-flowing current. Seventy-nine bodies were recovered, most of them children. What makes George Beloe's headstone extraordinary is that it depicts, in stone relief, the collapse of the bridge. Now eroded by weather after more than a century and a half, you can still make out the two ends of the bridge, and the eye of God looking down as the deck collapses into the Bure. Having made your circumnavigation, you can now step through the huge porch, which faces the market place, into the interior of this extraordinary building. You may know already what to expect, but if you do not then you will be struck by how outstandingly light and clean the interior is. As your eyes adjust to the great distances, you may then notice the curious pattern of the arcades which open and close vistas as you begin to wander, as if this was a maze of vast, low rooms. And then you would notice the jaunty, bleached Festival of Britain feel of the furnishings, the acreage of modern glass, most of it very good, and the uncluttered simplicity, and then it will strike you - there is nothing old here. On the night of 24th June 1942, St Nicholas was completely destroyed by German bombing. All that was left standing were the outer walls and the tower, in danger of collapse. The stonework was utterly calcined by the fierce heat. In a town which had suffered so much over the previous twelve months, it was a greivous loss, and it would be almost twenty years before St Nicholas was open for business again. Essentially, it had to be rebuilt, using the surviving walls and tower. The chosen design was that of a relatively minor architect, but a man who would be responsible for the two great East Anglian church architectural controversies of the 20th Century, Stephen Dykes Bower. It is inevitable that a comparison should be made with Coventry Cathedral, which also replaced a bombed predecessor. The two buildings are about the same size, the work was carried out over the same period of years in the late 1950s, and the two buildings opened just a year apart. But while Basil Spence's Coventry Cathedral is a fabulous, iconic structure in the spirit of the age and in the full flush of post-war enthusiasm, St Nicholas at first appears little more than an exercise in pedantic and ponderous medievalism. As Bill Wilson points out, the £315,000 awarded by the War Damage Commission here was but a quarter of the money allotted to Coventry, but he also recalls Pevsner's scathing attack on the design: What an opportunity was lost! What thrilling things might have been done inside! A modern interior, airy, noble, of fine materials could have arisen to affirm the vitality of C20 church architecture inside the C13 walls. How defeatist does the imitation-Gothic interior appear, once this has been realized! And yet, and yet. When I step into St Nicholas now, I find myself thrilled by the cool light, the almost monastic simplicity. Apart from the hideous organ, the open spaces are barely punctuated, and there is something timeless and eternal about the silence. Dykes Bower's arcades are hardly there, vanishing into the whiteness above and the simplicity of the bare wood roofs. Through the crossing the jewel-like chancel glows, almost beckoning. From the other direction the west window does exactly the same. What Pevsner could not have foreseen is that this building is entirely suited to modern Anglican spirituality which has extended in recent years beyond mere congregational worship. And he also could not have foreseen how we would come to view the simplicity of Dykes Bower's design, the white walls, the lack of detail, the stripped, bleached wood and the cool, hard floors as being exactly symptomatic of the 1960s, the decade which gave this new building its birth. 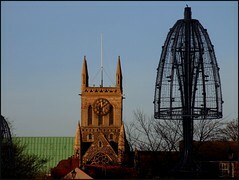 For this, I like it very much, not least because it was reopened on 8th May 1961, the day I was born. Perhaps best of all I like the range of glass around the east and west windows by Brian Thomas. They are all of a piece, installed for the reopening. There can be few modern schemes outside of the cathedrals on so vast a scale, and yet they are elaborate, detailed and intimate. This great, light building is the perfect setting for them. The east window depicts the Crucifixion, surrounded by scenes from the Passion. In the north aisles are the joyful mysteries of the Christ story, from the Annunciation to the Presentation, while in the south aisles is the salvation story from Adam and Eve to Christ's mission. At the west end are the sacraments. There are effectively four aisles, two either side of the church, which extend up to beyond the crossing. The aisles each side become conjoined as they flank the nave itself, making the nave appear narrow and tall in comparison, despite what we know to be true of it. The triple lancet of the west window aids this illusion. Below it, the Norman font is from a redundant Wiltshire church, and looks most un-East Anglian. There are small artworks and minor survivals dotted about, but they do not intrude. The early 18th century pulpit came from St George, a few hundred metres to the south, now closed. The pews in the central part of the nave are also from St George, and although they are simple they strike a jarring note. Modern chairs would be better. Dykes Bower screened off the south chancel chapel to create a space for private prayer, and this doesn't work as well as it might, creating an obstruction within the otherwise openness of the east end. The garishly painted organ is also his. But this is a place to wander - despite the vast scale I found I had circumnavigated the interior three times without really noticing. It struck me then quite how much Dykes Bower must have intended this - he was designing a great town church interior, and looking across the water to Holland and Belgium as much as to anywhere else in England. He wanted a church that opened onto the market place, into which shoppers could come for a sit down and even a prayer, a building whose open spaces would be wandered through. Having told you all of this, I expect you are already making plans to come to Great Yarmouth and visit this church for yourself as soon as you possibly can. You may be aghast to learn, then, that this wonderful structure is hardly ever open to the public. At present, you can only visit on a Saturday morning: otherwise, it is merely the private, vastly-subsidised venue of a small group of Sunday worshippers. Nothing could be more short-sighted, and little could be more shameful. 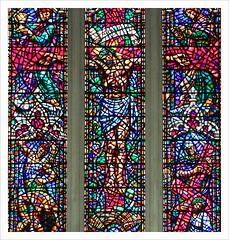 For, while the mission of the Church of England is increasingly seen as to the whole people of God and not just to its registered members, and churches all over England are making themselves open to pilgrims and strangers wanting to feel a sense of the numinous and even perhaps to be open to a spirituality which may or may not be Christian but which is at least a yearning for God, the people of Great Yarmouth are locked out of their own church from day to day. 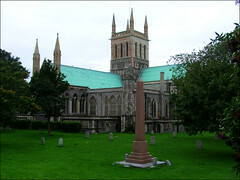 They can at least visit the Catholic church of St Mary, which has a sign saying, curiously, that the church is open as often as possible, but that is a small Victorian building, and cannot compare with St Nicholas which is, after all, the heart and soul of Great Yarmouth's history, a touchstone down its long generations. But if you can get inside, and if you stand beneath the crossing looking westwards, the view is typical: clean, clear, full of light and gravitas with a sense of prayerfulness and even of mystery. There is enough to convince. This building does not feel defeatist; if anything, it was a rather brave approach to the problem. But few people saw it like that at the time, and few people did in the years after. It must be said that Dykes Bower did not go out of his way to win friends in the modernist world - as his wikipedia entry says of him, he was a devoted and determined champion of the Gothic Revival style through its most unpopular years. And yet, he had the last laugh. 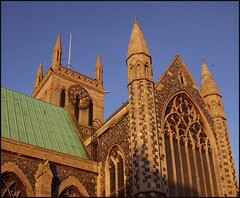 When he finished here, he spent the next two decades overseeing the transformation of the church of St James at Bury St Edmunds into a fitting cathedral for the Diocese of St Edmundsbury and Ipswich. His is the chancel there, his the transepts, the side chapels and the north ambulatory, all in his own faux-gothic style. And when he died in 1994 he left a cool two million pounds to the Diocese for the construction of a huge Gothic central tower over the crossing of the cathedral. The Diocese spent another ten years or so raising the extra needed, which was fairly controversial in those years when the CofE was haemorraging cash left, right and centre. Despite the voices against it, the tower was built, entirely to Dykes Bower's fancy, and the gleaming white edifice now towers over Bury as if it had been there for half a millennium or more.